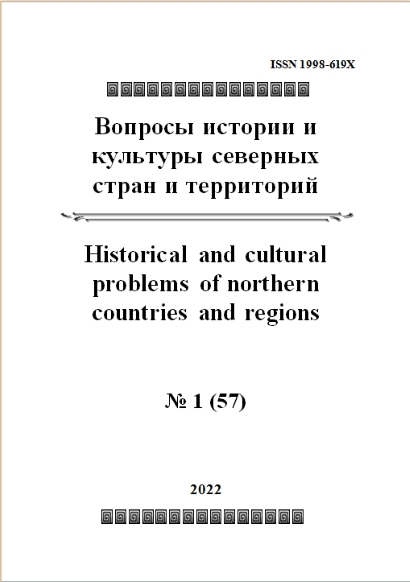 “Historical and cultural problems of northern countries and regions” – the scientific journal whose purpose is to promotion the achievements of Russian scientists and humanitarians who work mainly in the peripheral regions of the country, promoting the achievements of Russian northern regions, coordinating the work of Russian and foreign scientists working on the study of the history and problems culture of the peoples of the northern territories, and the problems of development of these northern regions. One of the priorities of the journal is to help young researchers to publish the results of their scientific achievements. The Editorial Board includes prominent scientists from Moscow, St. Petersburg, Apatity, Arkhangelsk, Vologda, Kirov, Perm, Petrozavodsk, Syktyvkar, Yakutsk, Belarus, Canada, Finland and Estonia. The journal publishes well-known Russian and foreign scientists, diplomats, representatives of the government and public bodies of the Russian Federation: Patriarch Kirill of Moscow and All Russia; Metropolitan Panteleimon of Yaroslavl; Andrei Fursenko, Minister of Education and Science of the Russian Federation (for the period of publication), Doctor of Physical and Mathematical Sciences; Gennadiy Oleynik, Chairman of the Federation Council Committee on Northern Affairs and National Minorities (for the period of publication); Pivnenko Valentina, Chairman of the Committee on Problems of the North and the Far East of the State Duma of the Russian Federation (for the period of publication); Volauer Benjamin, Consul for Political and Economic Affairs U.S. Consulate General in St. Petersburg (for the period of publication); Yatvetsky Boleslav, First Secretary of the Israeli Embassy in the Russian Federation (for the period of publication); scientists from Japan, France, Germany, Finland, Belarus, USA and other countries. The journal created in collaboration with the Ministry of Regional Development of the Russian Federation. The scientific journal "Historical and cultural problems of northern countries and regions", established in 2008, is published quarterly in Syktyvkar (Komi Republic). Is distributed in Russia and in other northern countries (the U.S. (Alaska), Canada, Norway, Sweden, Finland, Iceland). The journal is published in print, full version published journal issues are available on the official website: http://www.hcpncr.com/. Articles are published in two languages - Russian and English. The journal accepts articles from authors, regardless of their place of residence. All manuscripts are peer reviewed. Headings of the journal: 1. Scientific articles (in archeology, geography, demography, history, folklore and literary criticism, ethnology (ethnography), culturology, etc. ); 2. Current state of the northern regions. Politics, economics, culture; 3. Persons; 4. Bibliography, reviews.